meatless monday: greek geek roundup | here | there | everywhere. So far it’s been a fairly Greek summer. Not long ago, celebrated food truck Souvlaki GR opened the doors to its first permanent establishment, just down the street from our apartment. Greek street food, in the LES, serving up warm pita triangles with tzatziki sauce and dill yogurt, big platters piled with horiatiki (cucumber and tomato salad with crumbled feta) and hand-cut Greek fries sprinkled with oregano. 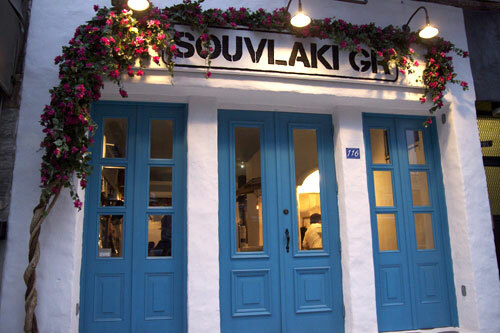 That it’s delicious and cheap, with a glass of chilled retsina, and that it seems we eat there at least 3 times per week, Souvlaki GR has become our accidental, official summer fare of 2011. If you’re in NYC, do go, and do order a little of everything. Here’s a roundup of Greek treats, all meatless, all perfect for summer. Opa! And for dessert: Baklava from Food Network’s Alton Brown.